Manufacturing has played a leading role in the nation’s economic recovery, adding 504,000 jobs between February 2010, when manufacturing employment fell to its lowest point, and October 2012. These 504,000 jobs constituted 11.1 percent of the 4.5 million jobs created in that period. However, this relatively recent manufacturing boom comes on the heels of more than a decade of sharp declines in manufacturing employment. Between March 1998 and October 2012, the United States lost 5.7 million manufacturing jobs, nearly a third (32 percent) of manufacturing employment; most of these job losses were due to the growing U.S. trade deficit. Taken together, these trends highlight the manufacturing sector’s importance to the U.S. economy and recovery, as well as the role of trade deficits in eliminating U.S. manufacturing jobs. This paper argues that reviving U.S. manufacturing requires eliminating a jobs-destroying U.S. trade deficit in goods by ending currency manipulation and investing in a series of coordinated manufacturing policies. It also estimates the economic benefits of ending currency manipulation on trade, jobs, and public budgets in the United States and in Ohio, one of the nation’s preeminent manufacturing states. But currency manipulation is only one of many demand-side constraints on manufacturing job growth; other countries’ dumping practices, insufficient U.S. investment in infrastructure, and other factors have also been barriers to the recovery of U.S. manufacturing. Supply-side constraints also play a role: The United States and its domestic manufacturers are competing in an environment where many other countries, including Germany, Japan, China, and Korea, operate comprehensive manufacturing and labor force development programs to support their traded goods industries; the United States does not. Such steps could lead to the complete elimination of the U.S. goods trade deficit, which would allow U.S. manufacturing to recover most or all of the market share and employment lost since the late 1990s. Growing U.S. trade deficits over the past 15 years have eliminated millions of U.S. jobs, with manufacturing particularly hard-hit. For example, the rise in the U.S. trade deficit with China between 2001 and 2011 alone eliminated 2.7 million U.S. jobs, over 2.1 million (76.9 percent) of which were in manufacturing (Scott 2012a). Currency manipulation by China and other countries, such as Japan and Singapore, is the largest single cause of U.S. trade deficits. Currency manipulation artificially reduces currency values, which acts as a subsidy to all the exports of these countries. It also acts as a tax on U.S. exports—both exports to these countries as well as to third-country markets (i.e., countries where we compete with currency manipulators’ exports). China is the most important competitor for U.S. exporters in markets around the world. It is no coincidence that China is also the world’s foremost currency manipulator. Globally, currency manipulation by about 20 developed and developing countries5 raised their collective current account surplus (the broadest measure of their trade balance) by approximately $700 billion in 2011. The corresponding U.S. share of the global trade deficit caused by currency manipulation was as large as $400 billion in that year (Gagnon 2011; Gagnon 2012). U.S. goods trade is dominated by manufacturing: In 2011, about 86 percent of U.S. goods exports and 78 percent of all goods imports were manufactured products, according to the U.S. International Trade Commission (USITC 2012). Therefore, when imports are higher than exports and the share of imports is expanding, i.e., when the goods trade deficit is growing, domestic manufactured products and manufacturing jobs are displaced. And, as explained in the previous section, currency manipulation has encouraged more rapid growth of U.S. imports and repressed U.S. exports to both currency manipulators and to all countries where the United States competes with currency manipulators (such as China, which is the United States’ most important competitor in total world trade). The U.S. goods trade deficit increased from $198.4 billion in 1997 (equal to 2.4 percent of GDP) to $738.4 billion in 2011 (equal to 4.9 percent of GDP).7 Numerous studies have shown that trade deficit growth of this magnitude displaces many manufacturing jobs. For example, when the U.S. trade deficit with China increased $217.5 billion between 2001 (when China entered the World Trade Organization) and 2011, it eliminated 2.7 million U.S. jobs—over 2.1 million (76.9 percent) of which were in manufacturing (Scott 2012a). And when the U.S. non-oil trade deficit displaced 5.6 million jobs in 2007 (jobs that would be supported if the trade deficit were eliminated), more than 4 million, or 70 percent, of those jobs were in the manufacturing sector (Scott 2008). Therefore, it is no surprise that the country was losing manufacturing jobs as the goods trade deficit increased. The United States lost 5.7 million manufacturing jobs between March 1998 and October 2012 (BLS 2012a), with the vast majority of these job losses attributable to the growth of the U.S. trade deficit (Scott 2012b). Conversely, although the manufacturing sector employed only 8.9 percent of all U.S. workers in 2011 (BLS 2012a), improvements in the trade balance should disproportionately improve U.S. manufacturing industries and manufacturing employment, as is shown later in this paper. The loss of manufacturing jobs has been particularly costly for middle-class workers, especially those without a college degree, and their families. Manufacturing is one of the best sources of jobs with high wages and full benefits for such workers. The dwindling number of these jobs has hit manufacturing-intensive states such as Ohio especially hard in recent decades. As seen in Figure A, the decline in manufacturing employment across the country and throughout the Midwest since the turn of the century was steep—and was particularly dramatic in Ohio. Between January 1995 and October 2012, manufacturing employment in Ohio declined by more than a third, falling to 63.5 percent of January 1995 employment in October 2012 (BLS 2012b). The dramatic decline in Ohio’s manufacturing employment is reflected in Ohio manufacturing’s declining share of overall U.S. manufacturing employment (from 6.0 percent in January 1995 to 5.5 percent in October 2012) and the declining share of Ohio’s non-farm employment accounted for by manufacturing (from 20.0 percent in January 1995 to just 12.6 percent in 2011) (BLS 2012b). This is particularly important given the role the manufacturing sector has played in providing high wages and generous benefits to Ohio workers (due in large part to higher unionization rates in that industry). 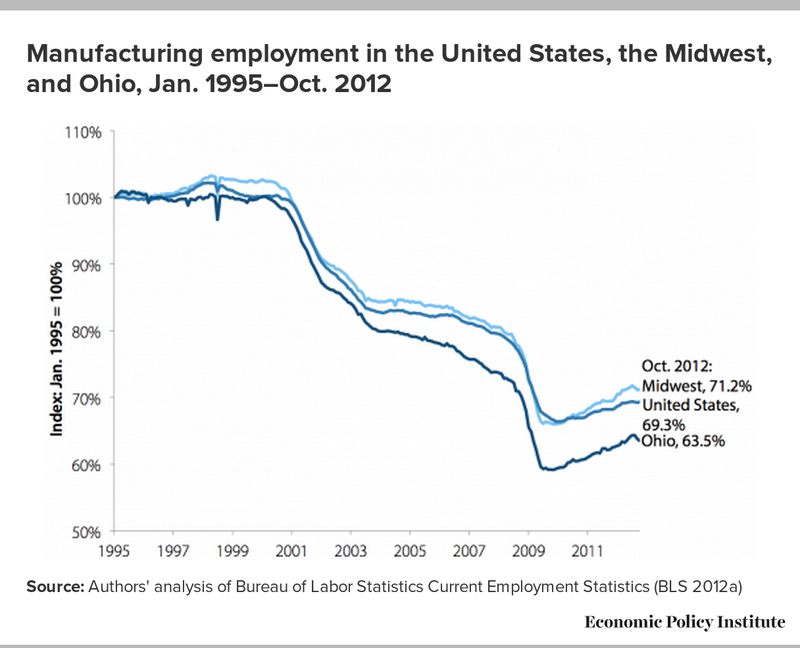 Recent trends in Ohio’s manufacturing employment have occurred against the backdrop of the Great Recession and its aftermath. 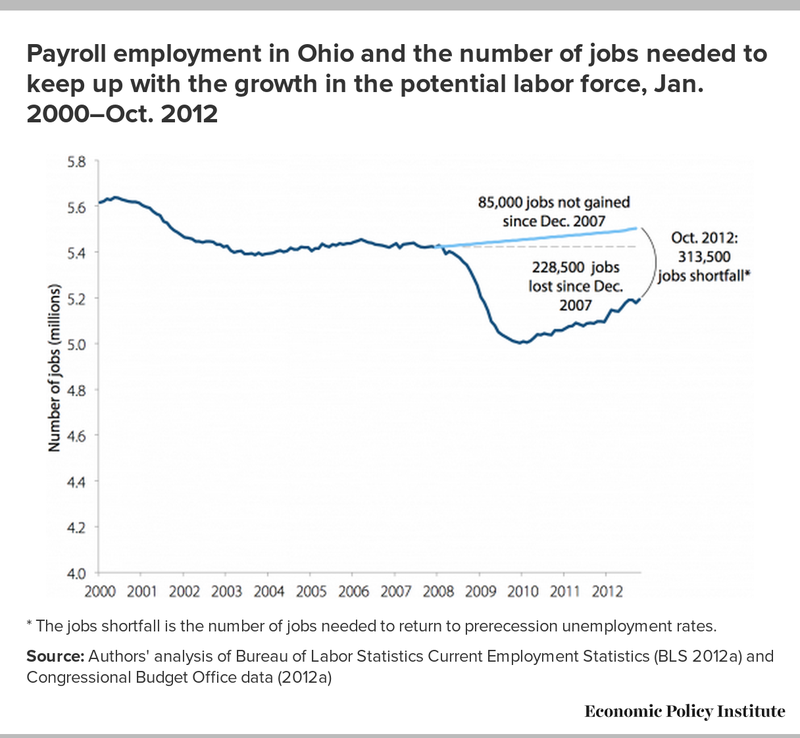 Despite steady gains since employment bottomed out at the end of 2009, Ohio continues to face a significant “jobs shortfall” (the number of jobs needed to return to prerecession unemployment rates), as shown in Figure B. In October 2012, Ohio’s economy needed roughly 313,500 jobs to return to the unemployment rate of December 2007—228,500 jobs to replace those still lost during the recession and its aftermath, and 85,000 new jobs to keep up with growth in the working-age population since December 2007 (Hall 2012). To close the jobs shortfall within three years, Ohio would need to add an average of 10,000 jobs each month. While Ohio added 95,300 jobs from December 2011 to July 2012 (averaging 13,600 a month), employment growth has slowed considerably, with a total of just 2,300 jobs created from July to October 2012 (fewer than 800 per month). 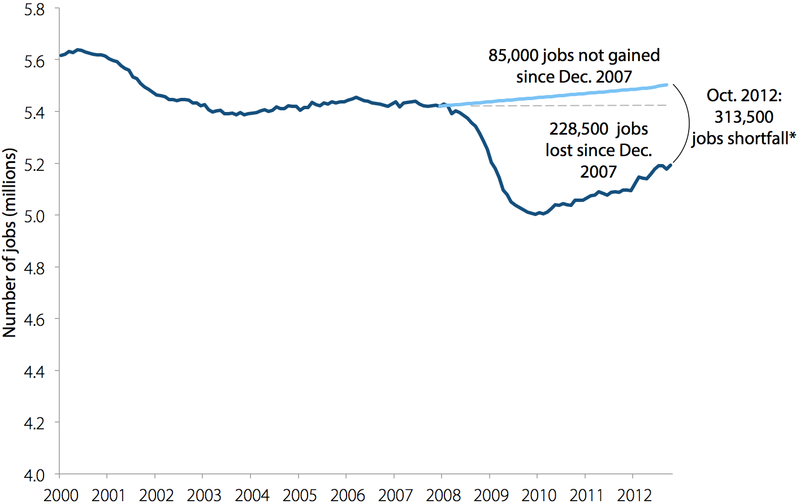 * The jobs shortfall is the number of jobs needed to return to prerecession unemployment rates. Jobs created by eliminating currency manipulation would help shrink the state jobs shortfall as well as the larger national jobs shortfall (EPI 2012). The leading role played by manufacturing in the nation’s recovery from the Great Recession underscores the urgency of addressing the more than decade-long decline in manufacturing employment. Between February 2010, when U.S. employment fell to its lowest point, and October 2012, the nation created 504,000 manufacturing jobs, which constituted 11.1 percent of the 4.5 million jobs created in that period (BLS 2012a). But manufacturing employment declined slightly between July and October 2012. The recent slowing of U.S. manufacturing employment growth, evident also in Ohio and the Midwest, was expected as federal spending under the American Recovery and Reinvestment Act of 2009 wound down. The slowdown suggests that further growth in manufacturing will require additional demand stimulus. Note, however, that manufacturing employment year-over-year since January 2009 has still been much stronger in the Midwest and Ohio than nationwide, as shown in Figure A. 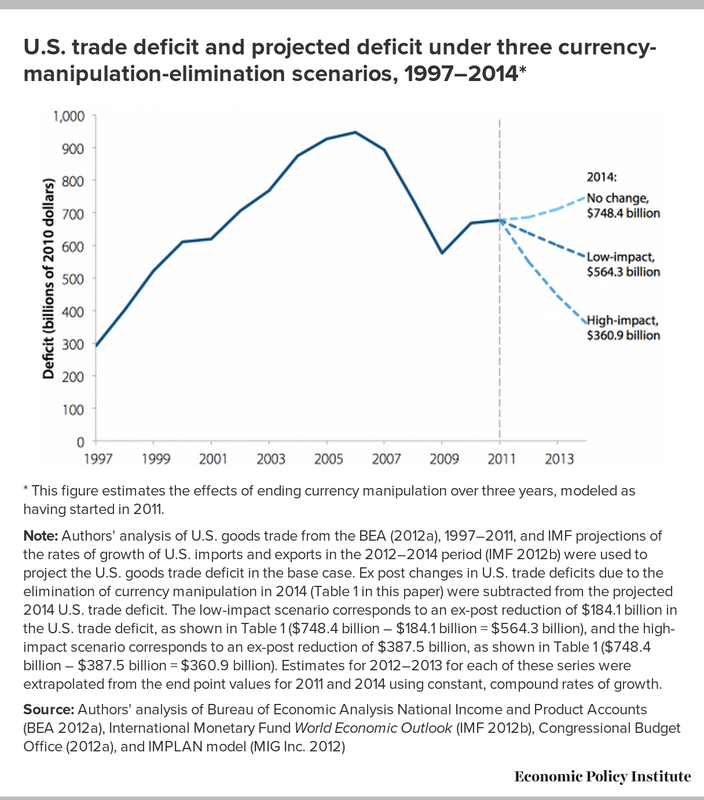 The following section analyzes the potential effects of ending currency manipulation. This EPI briefing paper estimates the effects of eliminating currency manipulation over three years, modeled as having started in 2011. It uses the IMPLAN model to evaluate the effects on the United States and Ohio of an ex ante $190.5 billion to $399.5 billion reduction in the U.S. goods trade deficit (i.e., a $190.5 billion to $399.5 billion increase in net exports) in 2014.9 (See the methodological appendix for details on the model.) A baseline forecast was generated for U.S. exports and imports in each of the 108 industries identified under the North American Industry Classification System (NAICS) four-digit codes. The trade forecasts extrapolated trade flows by assuming that rates of growth in real exports and imports at the industry level between 2010 and 2011 remain unchanged between 2012 and 2014. The base scenario assumes that growth in trade continues at those levels through 2014. 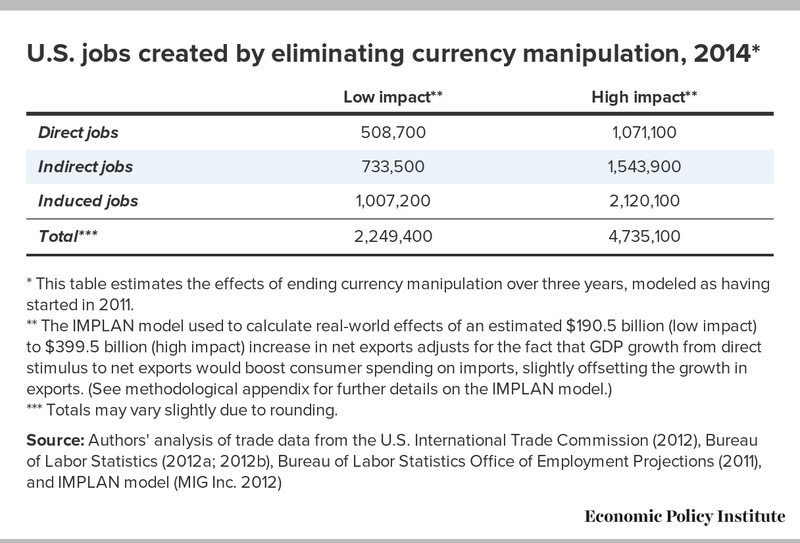 The low-impact case (assuming a $190.5 billion reduction in the U.S. goods trade deficit) and high-impact case (assuming a $399.5 billion reduction) were estimated by making proportionate changes in the rates of growth in exports and imports, assuming that the full effects of ending currency manipulation would not be felt for three years.10 All estimates are relative to base-scenario trade flows in 2014. * This table estimates the effects of ending currency manipulation over three years, modeled as having started in 2011. As a result of the increase in net goods exports, U.S. GDP would rise by between $225.0 billion and $473.7 billion (between 1.4 and 3.1 percent of U.S. GDP in 2014) (CBO 2012a). The increase in demand for Ohio’s net goods exports would increase Ohio GDP by between $8.3 billion and $17.4 billion, equal to between 1.9 and 3.9 percent of Ohio GDP in 2014 (authors’ analysis of CBO 2012a and BEA 2012b). Thus, the reduction in the U.S. goods trade deficit would have a proportionately larger impact on Ohio GDP. This is because trade has a large impact on manufacturing employment, and in 2011 Ohio had a larger manufacturing share of employment (12.6 percent) than the United States as a whole (8.9 percent) (BLS 2012a and BLS 2012b). The growth in net goods exports and GDP would support substantial numbers of jobs. At the national level, about 2.2 million to 4.7 million U.S. jobs would be created, equal to 1.4 to 3.0 percent of the projected total U.S. labor force in 2014 (CBO 2012a). In Ohio, 94,900 to 199,700 jobs would be created, equal to 1.6 to 3.4 percent of the state’s projected labor force in 2014 (authors’ analysis of CBO 2012a). These findings demonstrate that increasing net goods exports by ending currency manipulation is one of the most significant job-generating policies available at the state and national levels—especially given political gridlock over fiscal policy. The effect on the unemployment rate would be somewhat smaller than indicated by these labor force shares. One of the characteristics of the Great Recession is that millions of workers dropped out of the labor force as the number of unemployed workers soared relative to the number of job openings (Shierholz 2012a). As job openings increase due to falling trade deficits, some workers would reenter the labor force, thereby putting upward pressure on the unemployment rate. Overall, at the national level, the unemployment rate would likely decline by between 1.0 and 2.1 percentage points (authors’ analysis of CBO 2012a and Shierholz 2012a). Because manufacturing plays a larger role in Ohio’s economy, the state’s unemployment rate would decrease further, possibly by between 1.3 and 2.7 percentage points. Eliminating currency manipulation could reduce the state’s jobs shortfall as of October 2012 (depicted in Figure B) by between 30.3 percent and 63.7 percent. This is a reflection of the job-creating power of more effective trade policy. In October 2012, the national jobs shortfall was 9.0 million (Shierholz 2012b). The 2.2 million to 4.7 million U.S. jobs that would be created by eliminating currency manipulation would reduce the U.S. jobs gap by between 25.0 percent and 52.6 percent, slightly less than in Ohio. This also reflects that Ohio would benefit disproportionately from reducing the U.S. trade deficit (in general, and by eliminating currency manipulation in particular). Reducing the goods trade deficit would also generate a substantial increase in wage incomes in the United States and Ohio. Nationally, employee compensation would increase by between about $113.0 billion and $237.8 billion. In Ohio, employee compensation would rise by between about $4.7 billion and $9.9 billion. The direct, indirect, and induced U.S. jobs that would result from increasing U.S. net goods exports by between $190.5 billion and $399.5 billion (ex ante) are shown in Table 2. Direct jobs are those supported directly by industries affected by increased net exports, such as those producing aircraft, machine tools, and chemicals. Between 508,700 and 1,071,100 jobs would be directly supported by the elimination of currency manipulation. These would be concentrated primarily in manufacturing industries, which produce most U.S. exports. An additional 733,500 to 1,543,900 indirect jobs would be supported. These jobs are in industries that supply parts, materials, and other inputs (including services) to industries that produce net exports. *** Totals may vary slightly due to rounding. Induced jobs are the result of additional spending of wages and other income generated by the production of net exports. Since wages are relatively high in manufacturing (where most direct and indirect jobs are located), such spending generates large numbers of jobs, primarily in non-manufacturing industries, since domestic manufactured products represent only a small share of total U.S. consumer spending. The growth of net goods exports spurred by ending currency manipulation would support an additional 1,007,200 to 2,120,100 induced jobs. The sum of direct and indirect jobs supported in these two scenarios is about 1.2 million to 2.6 million. Approximately 0.81 induced jobs are supported for each job created through (combined) direct and indirect effects. Table 3 and Table 4 show the impacts of increased net goods exports through ending currency manipulation on employment by industry in the United States and Ohio, respectively. By far the largest number of jobs is gained in manufacturing, both nationally and in Ohio. In the United States, 619,500 to 1,304,000 manufacturing jobs would be created by eliminating currency manipulation. This is 27.5 percent of the total number of the direct, indirect, and induced jobs that would be created by eliminating currency manipulation. *** National shares are constant across industries in both scenarios. **** Totals may vary slightly due to rounding. *** State shares are constant across industries in both scenarios, but they differ from national shares due to differences in the industrial structures of Ohio and the United States (see text for further details). Within U.S. manufacturing, 426,000 to 896,600 of these jobs would be in durable goods industries, 18.9 percent of all jobs gained, and more than two-thirds of all manufacturing jobs gained. Durable goods industries encompass some of the most high-wage, high-technology occupations within manufacturing. Some of the biggest winners include non-electrical machinery (81,100 to 170,800 jobs created), computer and electronic parts (70,800 to 149,000 jobs created), and motor vehicles and parts (52,600 to 110,700 jobs created). Overall, the creation of 619,500 to 1,304,000 U.S. manufacturing jobs would go a long way toward reversing the loss of 2.3 million manufacturing jobs during the Great Recession and its aftermath. When added to the 504,000 manufacturing jobs already created between February 2010 and October 2012 (BLS 2012a), from nearly half to more than three-fourths of the 2.3 million jobs lost could be replaced. Ending currency manipulation would not restore all of the manufacturing jobs lost since the 1990s, but it would result in the largest gain of manufacturing jobs since the late 1970s (the last period of sharply declining U.S. trade deficits). Outside of manufacturing, the largest job gains in the United States would occur in health and social services (171,500 to 361,100 jobs gained) and in retail trade (166,200 to 349,900 jobs gained). Industries such as professional, scientific, and technical services (147,900 to 311,300 jobs gained), finance and insurance (120,800 to 254,200 jobs gained), and administrative and waste services (131,600 to 277,000 jobs gained) are major providers of services to manufacturing. 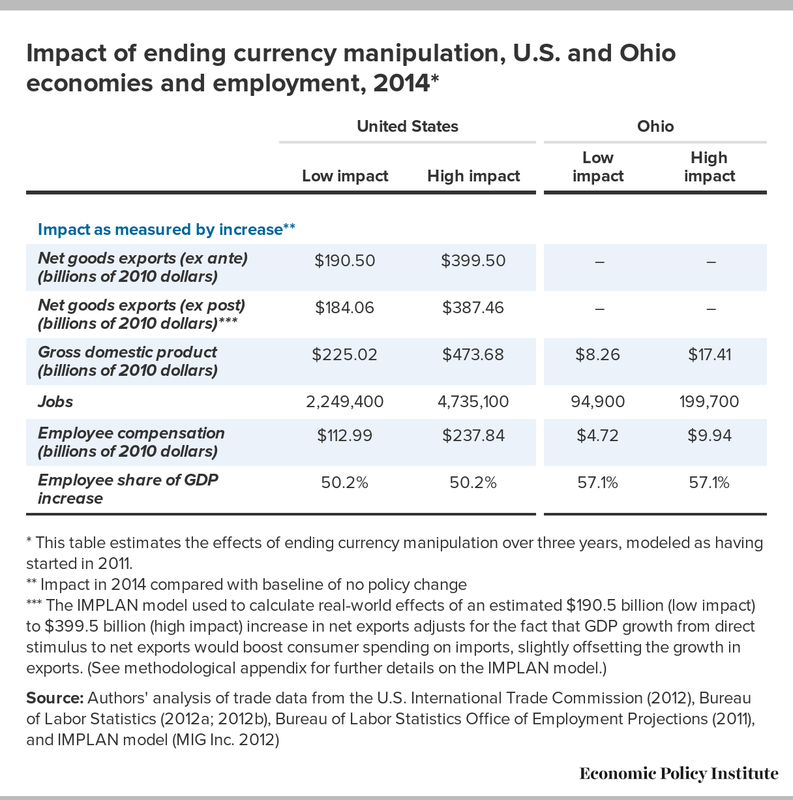 The impacts of eliminating currency manipulation on manufacturing employment would be proportionately larger in Ohio than in the United States, as shown in Table 4. In Ohio, 36,100 to 75,900 manufacturing jobs would be created by eliminating currency manipulation. This is 38.0 percent of the total direct, indirect, and induced jobs that would be created in Ohio by eliminating currency manipulation. Within Ohio manufacturing, 27,600 to 58,000 of these jobs would be in durable goods industries, or 29.1 percent of all jobs gained. The durable goods share would be more than three-quarters of the total of all manufacturing jobs gained in Ohio. High-wage, durable goods industries with big job gains in Ohio would include motor vehicles and parts (6,500 to 13,600 jobs created), non-electrical machinery (6,200 to 13,000 jobs created), and primary metals (3,200 to 6,800 jobs created). Outside of manufacturing, the largest job gains in Ohio would occur in health and social services (7,400 to 15,600 jobs gained) and in retail trade (6,300 to 13,200 jobs gained). Other industries with large gains, such as administrative and waste services (4,900 to 10,400 jobs gained), professional, scientific, and technical services (4,700 to 9,900 jobs gained), and finance and insurance (4,100 to 8,700 jobs gained) are major providers of services to manufacturing in Ohio. As shown in Table 1 earlier, reducing the goods trade deficit by ending currency manipulation would increase U.S. GDP by between $225.0 billion and $473.7 billion over three years, or by between 1.4 percent and 3.1 percent of projected GDP in 2014 (CBO 2012a). Increases in GDP have a substantial positive effect on tax revenues, since they reflect increases in wages and other forms of taxable income. In addition, as employment rises, expenditures on unemployment compensation, welfare, and other safety net programs decline. We use fiscal multipliers derived from Congressional Budget Office data on the output gap and cyclical contributions to the budget deficit to estimate the impacts of reducing the U.S. trade deficit on the federal budget deficit.11 Overall, the projected increase in GDP would reduce the federal budget deficit by between $78.8 billion and $165.8 billion (2010 dollars) over three years, and by similar amounts in the future as long as trade deficits are suppressed. This would reduce the U.S. federal budget deficit by between 20.4 percent and 42.9 percent.12 Even if a solution to the upcoming congressional budget fights is found, resulting in larger federal deficits for the next few years, reducing the trade deficit by between roughly $190 billion and $400 billion would still result in sizable reductions in future fiscal deficits, while stimulating the economy at no cost to the federal government. Creating jobs by ending currency manipulation would also increase tax revenues and decrease public spending in the states. 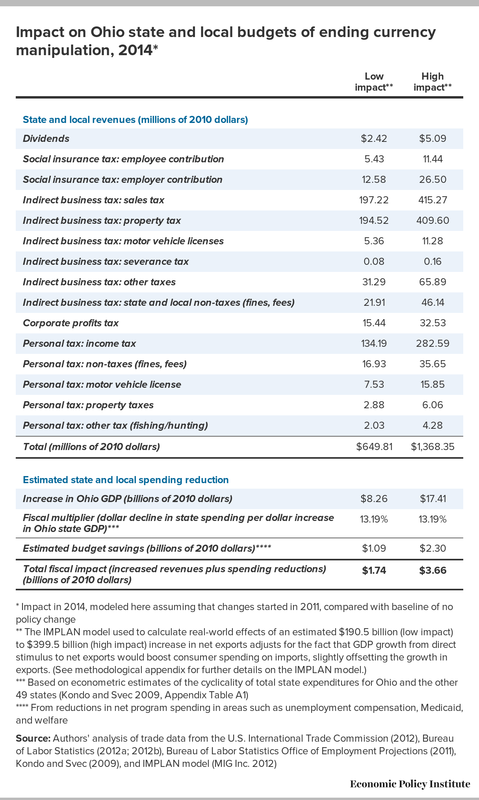 Table 5 shows the fiscal impacts on state and local budgets in Ohio of ending currency manipulation. The IMPLAN model projects that increasing U.S. net goods exports by between $190.5 billion and $399.5 billion would increase state and local tax revenues by a total of between $650 million and $1.4 billion in three years. The largest sources of increased revenue would be from sales taxes ($197.2 million to $415.3 million), indirect taxes on business property ($194.5 million to $409.6 million), and increases in personal income tax revenues ($134.2 million to $282.6 million). These projections illustrate that the best way to solve state and local budget problems is to grow the economy. The reductions in spending associated with job creation would do even more to improve state and local budgets in Ohio. Spending projections are based on a 50-state econometric model (Kondo and Svec 2009) that estimates the impact of changes in state GDP on state spending. Kondo and Svec (2009) estimate that for every $1 million increase in Ohio GDP, state and local spending falls about $131,900. As shown in Table 5, the IMPLAN model projects that ending currency manipulation would increase Ohio GDP by between $8.3 billion and $17.4 billion. Using the estimated spending elasticity from Kondo and Svec (2009), this would result in spending reductions of between $1.1 billion and $2.3 billion.13 Combining both revenue and spending projections, a $190.5 billion to $399.5 billion increase in net goods exports would result in a net increase of between $1.7 billion and $3.7 billion for Ohio state and local budgets. If the increase in net exports were maintained or increased after 2014, ending currency manipulation could generate tens of billions in budget savings and additional revenues for state and local governments in Ohio over the next decade. These budget resources could allow the state to rehire thousands of teachers, firefighters, and other public safety officials who have been laid off since the Great Recession began, and to make other investments in education, infrastructure, and the environment that would help generate sustainable growth in Ohio for years to come. Thus the elimination of currency manipulation has the potential to generate substantial benefits in terms of employment, GDP, and the fiscal balance in the United States and Ohio. But beyond ending currency manipulation, government must do more to create additional manufacturing capacity by stimulating research and development (R&D), encouraging the spread of best practices, expanding training, and increasing the supply of capital to small and medium-sized manufacturers. As the result of more than a decade of currency manipulation, unfair trade policies, and our failure to compete with the manufacturing and training policies of other nations, U.S. manufacturing has lost ground to competitors not only in China, but also in developed nations such as Germany, Japan, and Korea that have pursued advanced industrial and trade policies. U.S. manufacturing employment declined by nearly one-third between March 1998 and October 2012 (BLS 2012a), and the U.S. share of world export markets declined by a third over the same period, while Germany’s share remained roughly constant and China’s nearly tripled (IMF 2012a). * This figure estimates the effects of ending currency manipulation over three years, modeled as having started in 2011. Note: Authors' analysis of U.S. goods trade from the BEA (2012a), 1997–2011, and IMF projections of the rates of growth of U.S. imports and exports in the 2012–2014 period (IMF 2012b) were used to project the U.S. goods trade deficit in the base case. Ex post changes in U.S. trade deficits due to the elimination of currency manipulation in 2014 (Table 1 in this paper) were subtracted from the projected 2014 U.S. trade deficit. The low-impact scenario corresponds to an ex-post reduction of $184.1 billion in the U.S. trade deficit, as shown in Table 1 ($748.4 billion – $184.1 billion = $564.3 billion), and the high-impact scenario corresponds to an ex-post reduction of $387.5 billion, as shown in Table 1 ($748.4 billion – $387.5 billion = $360.9 billion). Estimates for 2012–2013 for each of these series were extrapolated from the end point values for 2011 and 2014 using constant, compound rates of growth. Eliminating the remainder of the U.S. goods trade deficit could close most of the remaining output gap over the next three to five years.14 But eliminating the entire U.S. goods trade deficit will not be easy, or cheap. A number of factors besides currency manipulation contribute to large U.S. goods trade deficits. On the part of other countries, these include unfair trade policies (such as subsidies, trade barriers, and illegal appropriation of the intellectual property of U.S. firms), repression of the human rights of workers and exploitation of the environment, and strong webs of public policies in support of manufacturing and other traded goods sectors. Underinvestment in infrastructure is another critical factor. For example, the United States needs $2.2 trillion in infrastructure investment over the next five years (American Society of Civil Engineers 2009). Enacting policies to more effectively stimulate demand, including ending currency manipulation, rebuilding infrastructure, investing in clean and renewable technology industries, and eliminating unfair trade policies (such as dumping, subsidies, and other unfair trade barriers) are the most important steps needed to rebuild U.S. manufacturing. New trade policies to respond to a dynamic and increasingly hostile international environment would move toward a restructuring of the world trading system so that it supports fair, balanced, and sustainable trade. And the massive public investments needed to rebuild U.S. infrastructure and develop new green and clean energy technologies will create domestic and foreign demand for new products that can help rebuild U.S. manufacturing, while increasing the competitiveness of the U.S. economy as a whole.15 Finally, reforms of health care and tax systems are also needed to increase competitiveness and rebalance public spending and revenues in the United States. While policies that address the demand side of the equation are critical, supply-side assistance is also crucial; U.S. manufacturing suffers from reduced capacity, in both absolute terms and relative to our trading partners. The United States and its domestic manufacturers are operating in an environment where many other countries, including Germany, Japan, China, and Korea, operate comprehensive, supply-side programs to support their traded goods industries.16 The United States needs to create a world-class environment to support domestic manufacturing. This should include greatly enhanced investments in technology development, and manufacturing “extension programs” such as the Manufacturing Extension Partnership, a program of the National Institute of Standards and Technology (NIST) that is vastly underfunded when compared with agriculture capacity-building programs of the USDA and with manufacturing capacity-building programs of other countries such as Canada. The United States also needs an intermediary institution to provide working and investment capital to small and medium-sized manufacturers, which often lack access to U.S. bank and capital markets that give preference to large multinational companies for bank loans and long-term corporate bonds. This “Mannie Mae” would be modeled on the federal housing enterprises (i.e., Fannie Mae, Freddie Mac, and Ginnie Mae) that channel capital into the nation’s housing finance markets. In addition, federal and state governments should work with schools, unions, and manufacturers to develop improved school-to-work training programs for non-college graduates, modeled on German and Danish labor force policies. Finally, Japan has a Ministry of Economy, Trade, and Industry (METI), a powerful agency that works to ensure that foreign trade policy complements efforts to strengthen domestic manufacturing interests. China through its five-year plans also provides critical strategic support to manufacturing efforts. The U.S. government needs to expand its capacity to develop and implement national trade and competitiveness strategies to respond to, and compete with, Japan’s METI and China’s five-year plans. The major elements of a more effective national trade and industrial policy were outlined in the previous section. A few examples will illustrate the scale of resources and commitments required to raise manufacturing support in the United States to a level on par with other countries. In the debates about the future of manufacturing, comparisons are frequently drawn between the decline of employment in agriculture and that in manufacturing. However, agriculture has continued to be a major U.S. exporter, and its contribution to the economy has been relatively constant in recent years despite the sharp decline in employment.17 Agricultural output has continued to grow (in real terms) despite falling employment. One of the primary reasons for rising output in agriculture is the steady growth of productivity (output per acre). Among the foremost reasons for the large and steady rise in agricultural productivity has been the key role played by the federal government in supporting research and its dissemination and diffusion. Resources dedicated to this task include the U.S. Department of Agriculture and its Agricultural Research Service, the system of land-grant colleges that support a vast base of primary research into agricultural sciences, economics and technology diffusion, and the USDA’s farm extension service, which has disseminated the latest research findings to farmers at the county and farm level. There is simply no counterpart in manufacturing to the USDA/land-grant college system of agricultural research, development, innovation, and diffusion of new technologies. The entity that comes closest to performing a similar role in manufacturing may be the relatively obscure National Institute of Standards and Technology (NIST). The president’s budget requests $857 million for NIST in fiscal 2013 (NIST 2012). In comparison, the USDA’s overall 2013 budget request, including mandatory crop subsidy programs and all other research programs, is $155 billion (USDA 2012). Some 72 percent of USDA expenditures are for nutrition assistance (the Women, Infants and Children program), which only indirectly benefits agriculture. Considering only non–nutrition assistance programs, which include farm and commodity programs, conservation and forestry, rural development, research, and other programs, the USDA’s fiscal 2013 request is still $43.4 billion, more than 50 times total spending on NIST programs. However, manufacturing generated 10 times as much output as did agriculture in 2011: $1,731.5 billion of value added in manufacturing versus $173.5 billion in agriculture (Bureau of Economic Analysis 2012c). Thus, per dollar of economic output generated, the USDA spends more than 500 times as much to support agriculture and related activities as NIST spends on manufacturing research and related activities. One of the most visible (and controversial) elements of NIST is the Hollings Manufacturing Extension Partnership (MEP), which is designated to receive $128 million in fiscal 2013 (NIST 2012). Comparative research by Ezell and Atkinson (2011) has shown that U.S. expenditures for the MEP program represent only 0.0014 percent of U.S. GDP. As a share of GDP, Canada spends more than seven times as much as the United States on manufacturing extension and services programs, and Japan spends nearly 23 times more than the United States. If U.S. spending on the MEP program were to rise to the Japanese level, it would require a budget allocation of approximately $5 billion per year, not large in the context of the USDA budget, or of overall government spending, but a huge, roughly 40-fold increase of the program. The U.S. GDP is approximately 4.2 times larger than Germany’s (IMF 2012b). If the U.S. MEP program were operated on the scale of the Fraunhofer-Gesellschaft, it would require total funding of $10.1 billion, of which $3.0 billion would be required from federal and state contributions. Thus, both the German and Japanese examples suggest U.S. spending on the MEP program should be expanded 20- to 40-fold. Expanding to a program of this scale would require time and resources to ensure that the needed capacities were developed and the resources well invested. But expanding the MEP program would by no means be sufficient to restore U.S. manufacturing competitiveness. The United States would also need to greatly expand its national R&D infrastructure, both through funding programs within federal agencies such as the National Science Foundation, the Department of Energy, the Environmental Protection Agency, and the National Institutes of Health, and by creating a national system of research universities dedicated to developing manufacturing technology and training manufacturing engineers. This training system would serve as the manufacturing equivalent of the USDA’s system of land-grant colleges, but on a larger scale. International comparisons also provide good models for labor/management relations, for financing small and medium-sized manufacturing firms and other exporting firms, and for training non-college-educated workers. German manufacturers practice “stakeholder capitalism” in which boards of directors include an equal number of repre­sentatives of managers and workers (Meyerson 2011). Germany also has an entire sector of banks devoted to financing small and medium-sized firms, which reduces such firms’ need to rely on private capital markets and lessens the demand for maintaining short-term profits. Additionally, Germany has a highly developed school-to-work job-training system for non-college-educated work­ers, which is much more effective than U.S. job training and displaced-labor-assistance programs. As a result, over the past decade Germany has maintained a large and growing trade surplus even relative to low-wage countries outside the eurozone, despite having some of the highest manufacturing compensation rates in the world (BLS 2011).18 Furthermore, it has maintained its com­petitiveness in world export markets, and its exports are dominated by autos and other high-value, durable manu­factured goods. There are externalities that lead U.S. private firms to underinvest in training, R&D, and other activities that would be supported by supply-side policies previously suggested. There are also market imperfections in capital markets that need to be addressed with new public institutions, as suggested above. These market imperfections provide an economic justification for investing public resources in activities that would enhance U.S. manufacturing capacity. While it is beyond the scope of this paper to detail a comprehensive program to develop a world-class environment to support U.S. manufacturing, it is clear that such programs are necessary and would greatly aid expansion of manufacturing and other traded industries, creating millions of additional jobs. Rebuilding manufacturing through rebalancing trade can help restructure the U.S. economy, close the output gap, and help return the U.S. economy to full employment. In the absence of such programs, the United States appears destined to suffer through a “lost decade” or more of excessive unemployment and output far below potential (Fieldhouse and Bivens 2012). On the other hand, implementing more effective trade and industrial policies, coupled with massive investments in infrastructure, clean technologies, and renewable energy, could reduce or eliminate the U.S. trade deficit altogether. This would support millions of additional good jobs, add hundreds of billions of dollars to U.S. GDP, and reduce unemployment and federal budget deficits while greatly improving state and local finances. These policies would be win-win for the United States, its workers, U.S. communities, and manufacturing and other high-wage domestic industries such as construction and utilities. Ending currency manipulation is one of the most effective tools available to support job creation in the United States and Ohio. It would be particularly beneficial for manufacturing businesses and their employees, especially in Ohio and the other states in America’s manufacturing heartland. Currency manipulation can be eliminated simply by making it illegal for China and other currency manipulators to purchase U.S. Treasury bills and other government assets. Ending currency manipulation would lead to the creation of 2.2 million to 4.7 million U.S. jobs, and 94,900 to 199,700 jobs in Ohio. This would reduce Ohio’s jobs shortfall (the number of jobs needed to return to the December 2007 unemployment rate) by between 30.3 and 63.7 percent. Ending currency manipulation would reduce unemployment in Ohio by between 1.3 and 2.7 percentage points, increase Ohio’s GDP by between $8.3 billion and $17.4 billion per year, and generate state and local budget savings (through a combination of increased tax revenues and reduced spending) of between $1.7 billion and $3.7 billion per year in Ohio. Ending currency manipulation would lower the U.S. national unemployment rate by between 1.0 and 2.1 percentage points, and reduce the national budget deficit by between $78.8 billion and $165.8 billion, with continuing benefits for years to come as long as the currency remained balanced. Finally, it could increase U.S. GDP by between $225.0 billion and $473.7 billion. Ending currency manipulation is the best policy tool available for creating millions of jobs in the United States and nearly 100,000 or more jobs in Ohio, while increasing tax revenues and reducing spending at the state and national levels. U.S. businesses are sitting on hundreds of billions of dollars of unused capital that is available for investment if demand can be generated for their products. Ending currency manipulation can harness this unused capital and the labor of millions of Americans, and it can help grow the economies of the United States and Ohio and help reverse the effects of the worst recession of the past 75 years. It is time for the United States and other nations to take the actions needed to end the destabilizing effects of currency manipulation, to help the world economy recover from past and present downturns, and put all nations on a path toward balanced, sustainable growth. But ending currency manipulation would not eliminate the entire U.S. goods trade deficit; it would leave a residual trade deficit of $360.9 billion to $564.3 billion after three years. This residual deficit represents both a threat and an opportunity. The United States should follow the lead of other advanced economies and create a world-class environment to support domestic manufacturing in the United States. This will require careful planning and substantial investments, but the potential rewards are great. Eliminating the total U.S. trade deficit over the next three to five years could create millions of additional jobs, beyond the 2.2 million to 4.7 million jobs identified here. Strengthened support of domestic manufacturing can also help close or eliminate the U.S. output gap and reduce the threat of a decade of lost output and productivity that looms large over the U.S. economy today. If this opportunity is ignored, the United States could easily slide into a full decade of high unemployment and massive losses of actual and potential output. Ending currency manipulation and rolling back U.S. trade deficits in manufactured goods can help the economy recover from the recession. It will not be easy or cheap, but it is well worth the required investments. — Robert E. Scott is director of trade and manufacturing policy research at the Economic Policy Institute. He joined EPI as an international economist in 1996. Before that, he was an assistant professor with the College of Business and Management at the University of Maryland at College Park. His areas of research include international economics and trade agreements and their impacts on working people in the United States and other countries, the economic impacts of foreign investment, and the macroeconomic effects of trade and capital flows. He has a Ph.D. in economics from the University of California-Berkeley. — Helene Jorgensen is an economic consultant, and senior research associate with the Center for Economic and Policy Research. She received her Ph.D. in economics from American University. She also holds a M.S. degree from George Mason University in Environmental Science and Policy. She is the author of the book Sick and Tired: How the U.S. Health Care System Fails Its Patients (Polipoint Press, 2010). Jorgensen has served as an advisor to the Census Bureau Advisory Committee on the Decennial Census and chaired the Bureau of Labor Statistics Labor Research Advisory Subcommittee. She previously worked as an economist for the Public Policy Department of the AFL-CIO. — Doug Hall is the director of the Economic Analysis and Research Network (EARN) at EPI. Hall previously served as director of operations and research for the Connecticut EARN partner, Connecticut Voices for Children, where he played a leading role in work related to family economic security and state tax and budget issues. He is the author or co-author of dozens of reports, and his work has been extensively cited by statewide media. He has a master’s in public policy and administration from McMaster University in Hamilton, Ontario, and a Ph.D. in political studies from Queen’s University in Kingston, Ontario. — The authors thank Josh Bivens, David Cooper, and Ross Eisenbrey for comments, and Hilary Wething for research assistance. — This research was made possible by support from the Alliance for American Manufacturing. The analyses presented here used the IMPLAN economic impact assessment model (version 3.0) by MIG Inc. for the United States and Ohio (MIG Inc. 2008, 2012). The IMPLAN model is based on input-output accounting to capture the interdependencies between different sectors in the national and regional economies. The impact analysis tracked the commodity flows from producers to intermediate and final consumers to estimate the impact of an improvement in the trade balance on output, value added, employment, and state and local taxes. In the IMPLAN modeling framework, “industries produce goods and services for final demand and purchase goods and services from other producers. These other producers, in turn, purchase goods and services. This buying of goods and services (indirect purchases) continues until leakages from the region (imports and value added) stop the cycle” (MIG Inc. 2004). The IMPLAN model is built primarily from data collected by the U.S. Bureau of Economic Analysis (specifically Benchmark I/O Accounts of the United States), the Bureau of Labor Statistics, and the U.S. Census Bureau. The data used in the IMPLAN modeling study are expressed in real 2010 dollars. The analysis consisted of three steps. The first step estimated the U.S. employment and output impacts of an improvement in the trade balance across 229 detailed industries using the United States IMPLAN model.19 The estimated total employment impact was defined as the sum of the direct impact, the indirect impact, and the induced impact, where the indirect effects are determined by the amount of the direct effect spent nationally on supplies, services, labor, and taxes; and the induced effect measures the money that is re-spent as a result of spending from the indirect effect (MIG Inc. 2004). To link the U.S. trade impact with the Ohio trade impact, the analysis assumed the ratio of total industry output in Ohio to national total industry output remained unchanged (2010 total output data for the United States and Ohio were provided by IMPLAN under Industry Accounts: Industry Output-Outlay Summary). This allowed us to capture both indirect and induced effects deriving in a straight line from an increase in Ohio’s net foreign exports, as well as the effects deriving indirectly from producers and consumers located in other states purchasing Ohio-produced goods and services. In the second step of the analysis, the estimated Ohio output impact was used as an input into the Ohio IMPLAN model. The resulting output was the direct employment impacts across detailed industries, to avoid double-counting indirect and induced impacts. The final step estimated the Ohio state and local tax impact for various sources of taxes using the Ohio IMPLAN model. For the United States, baseline forecasts of U.S. GDP and other macroeconomic variables (employment, unemployment, labor force, employee compensation) through 2014 are from the Congressional Budget Office (2012a). U.S. trade flows through 2014 were developed with forecasts from the IMF (2012b) in order to predict U.S. net exports, based on actual trade flows for 1997–2011 (Bureau of Economic Analysis 2012a) (see Figure C). The analysis developed projections of macroeconomic variables for Ohio by regressing actual (annual) data for the same U.S. variables on values for Ohio (e.g., regressing actual Ohio GDP on U.S. GDP for 1997–2011, and then using the regression coefficients to project Ohio GDP for 2012–2014 based on the CBO (2012a) forecast of U.S. GDP). Base case models of Ohio labor force and employment also included dummy variables for the recession period because of the sharp drop in Ohio in these variables since 2009 or 2010. IMPLAN results were compared with U.S. and Ohio base case macroeconomic forecasts for 2014 to estimate percentage changes in the variables estimated in the model. 1. “Currency manipulation occurs when a government buys or sells foreign currency to push the exchange rate of its currency away from its equilibrium value or to prevent the exchange rate from moving toward its equilibrium value” (Gagnon 2012, 1). 2. The model estimating jobs recovered over three years through currency revaluation begins with the latest available annual data for 2011 as the baseline. 3. All dollar-value 2014 projections modeled in this paper—e.g., output (GDP), trade, revenue, and spending estimates—are expressed in real 2010 dollars. 4. Read more about Japan’s Ministry of Economy, Trade, and Industry at http://www.meti.go.jp/english//index.html. 5. The top 20 currency manipulators identified by Gagnon (2012) are (ranked in order of foreign exchange reserves as a share of national GDP): Libya, Hong Kong, Algeria, Saudi Arabia, Singapore, Taiwan, Thailand, Malaysia, China, Switzerland, Bolivia, Philippines, Israel, Angola, Korea, Russia, Denmark, Japan, Azerbaijan, and Argentina. 7. The U.S. goods trade deficit peaked at $835.7 billion in 2006 (equal to 6.2 percent of GDP). It declined sharply during the Great Recession to a low of $505.8 billion in 2009 (equal to 3.6 percent of GDP) and has increased significantly since then, both in dollars and as a share of GDP (according to the authors’ analysis of USITC 2012 and BEA 2012a). See Figure C.
8. In a more recent paper, Bergsten and Gagnon (2012) estimate that global currency manipulation has increased the U.S. trade deficit by between $200 billion and $500 billion per year, and that the United States has lost 1 million to 5 million jobs as a result. These estimates essentially bracket the findings of this paper regarding both the trade and employment effects of currency manipulation, and they support this paper’s overall conclusions. 9. The analysis generated projected changes in trade flows based on actual rates of growth of exports and imports of 108 different types of goods. These changes were designed to generate approximately a $190 billion and a $400 billion improvement in the U.S. goods trade balance between 2011 and 2014. These simulations generated estimates that were within +/- $0.5 billion of these targets. Further refinements of the simulation were not possible within the constraints of the model. 10. The high-impact forecast assumes that the rate of growth of goods exports in each sector increases 3.1 percent, and that the rate of growth of imports declines by 3.0 percent. This is roughly consistent with a long-run estimate that changes in trade prices will affect real exports with a price elasticity of approximately 1.0. The low-impact scenario assumes that the rate of growth of exports increases by 1.5 percent and the rate of growth of imports declines by 1.4 percent. 11. Using data from the Congressional Budget Office, Bivens and Edwards (2010) estimate that “each dollar increase in actual gross domestic product (GDP) relative to potential GDP has been associated with a $0.37 reduction in [federal] budget deficits…” In the example considered by Bivens and Edwards, 79 percent of the deficit reduction was due to increased tax revenues, with the remainder due to reduced unemployment compensation. 12. These estimates are based on a CBO (2012b) projection that the budget deficit will decline by 70 percent between 2011 and 2014 under current policies in place as of August 2012. These estimates do not reflect the outcome of subsequent budget legislation. 13. These results are consistent with data for Ohio from the U.S. Census Bureau (2012), Survey of State and Local Finances for 2007–2010. Unemployment spending increased about $4 billion and total welfare spending increased about $1 billion in this period. Since some unemployment benefits are paid out of the employer-paid unemployment benefits funds, and from federal supplements, it is reasonable to assume that the net cost of increased unemployment spending to Ohio was in the range of $1 billion to $1.5 billion, plus net increases in welfare expenses. 14. Table 1 implies that each $1 improvement in the trade balance would result in $1.18 of net improvement in U.S. GDP. Thus, eliminating the trade gap could raise GDP by an additional $428 billion to $668 billion. 15. Pollack (2012) found that implementing four tax fairness policies (capping personal income tax deductions at 28 percent, raising taxes on high earners, implementing the Obama administration’s proposed international corporate tax package, and enacting a financial transaction tax), and using the proceeds to fund infrastructure investments over the next five years, would create roughly 1.3 million jobs in fiscal 2013 and more than 1.8 million jobs each year between fiscal 2014 and 2017. 16. This section draws selectively on Ezell and Atkinson (2012) and Meyerson (2011). 17. Agriculture (farms, fishing, and forestry) was a constant 1.2 percent of U.S. GDP between 2004 and 2011, while manufacturing’s share fell from 12.5 percent in 2004 to 11.5 percent in 2011 (BEA 2012c). 18. In 2010, compensation in German manufacturing averaged $43.76 an hour, 26 percent more than in the United States, where compensation averaged $34.74 (BLS 2011). It is important to note that the German current account surplus, which was 5.7 percent of its GDP in 2011 (International Monetary Fund 2012b), was partly due to a decade of wage restraint in Germany, combined with a property bubble and rising wages in peripheral countries in the European Union. 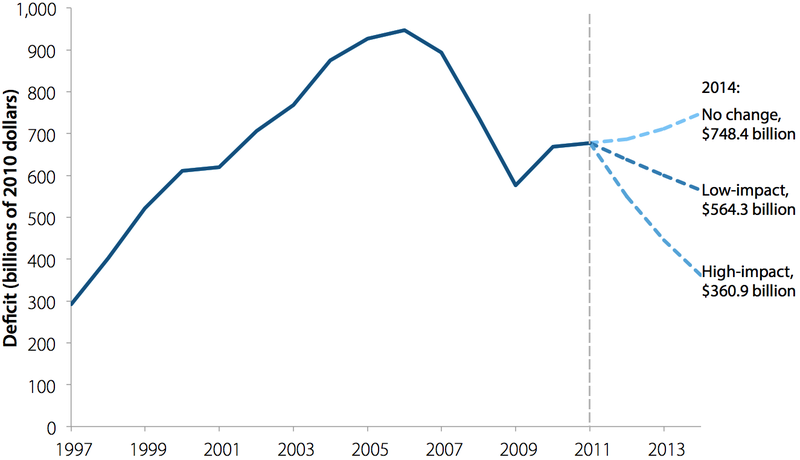 As a result, Germany effectively devalued within the euro area. To some extent, Germany is to the rest of the EU what China is to the United States—an economy running big surpluses by exploiting, to different degrees, the non-adjustability of the exchange rate. 19. IMPLAN agriculture and manufacturing sectors were aggregated to match the four-digit NAICS structure. Bureau of Labor Statistics Office of Employment Projections. 2011. “Special Purpose Files—Industry Output and Employment – Industry Output.” Washington, D.C.: U.S. Department of Labor. 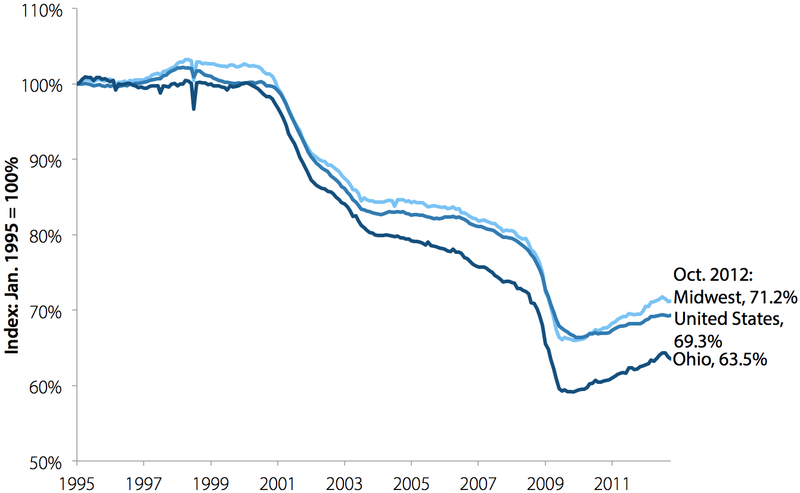 http://www.bls.gov/emp/ep_data_industry_out_and_emp.htm. International Monetary Fund (IMF). 2012a. International Financial Statistics [CD-ROM]. October 2012. MIG Inc. (formerly Minnesota IMPLAN Group, Inc.) 2004. The IMPLAN Input-output System. Report written by Scott A. Lindall and Douglas C. Olson.